LUZHSKY PROVING GROUND /Leningrad Region/, September 18. /TASS/. 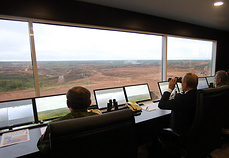 Russian President Vladimir Putin has reviewed progress in the Zapad-2017 military exercise at the Luzhsky proving ground, the Leningrad Region. 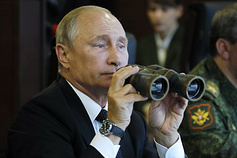 Defense Minister Sergey Shoigu, who was briefing Putin on the scenario of the exercise, said 95 foreign monitors from 50 countries were present at the event. "They appear to be interested," Putin said. Putin and Shoigu have highly praised the results of the West 2017 military drill, Commander of the Western Military District Forces, Colonel General Andrey Kartapolov told reporters. 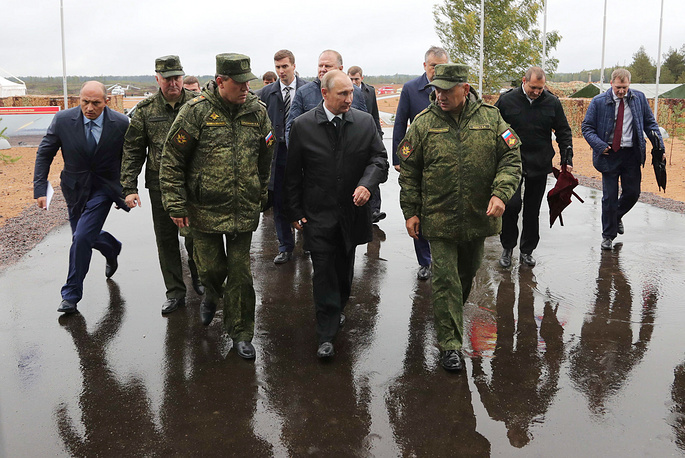 "The supreme commander-in-chief and the defense minister have highly praised [the drill,]" Kartapolov said. The commander noted the range of today’s drill. "The scope of today’s stage was great, about 600 kilometers at the front, and the forces completed tasks at three ranges at the same time," the colonel general noted. Units taking part in the exercises have a very high level of training and are successfully completing all the set tasks despite the complicated weather conditions, he said. "Units of the 25th separate motorized rifle brigade, 138th motorized rifle brigade, 240 kilometers to the north from us, units of the 2nd Taman division and paratroopers have acted very firmly," Kartapolov said. The commander also noted work of "strike and reconnaissance units that made it possible to use aviation with great precision in these complicated conditions.". The strategic exercise Zapad-2017 is the last phase of joint training by the armed forces of the Union State of Russia and Belarus this year. Participating in the exercise are up to 12,700 troops, 70 planes and helicopters, up to 680 pieces of military equipment on the ground, including 250 tanks, 200 artillery pieces multiple rocket launchers and mortars and ten ships.